Designed to be LEED Certified Silver-The Hotel at Arundel Preserve believes the environmental sustainability-luxurious comfort and superb service go hand in hand. The 150 guest rooms are well-appointed and designed to allow you to work and relax in the comfort and convenience of your own guest room. Our rooms are equipped with complimentary wired and wireless internet-designer bedding-custom designed contemporary furniture-and lavish bathrooms with upgraded bath amenities-with the choice of a king or two queen beds. Or upgrade to our Executive rooms and enjoy access to our exclusive 7th floor lounge and breakfast at Grillfire restaurant. 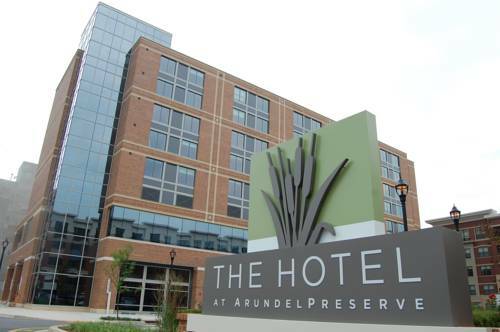 Located in Hanover MD- just minutes away from government facilities at Ft Meade Military Base and National Security Agency The Hotel at Arundel Preserve is adjacent to Arundel Mills Mall and just 10 minutes from Baltimore Washington International Airport. If you wish to organize a meeting or conference-we offer the most meeting space of any other hotel in the area-including a grand ballroom for more than 500 guests. Convenient to transportation-government agencies-business centers- attractions-shopping-and dining-The Hotel at Arundel Preserve is a boutique hotel that is more than just a place to stay. Grillfire: Grillfire is a dining destination offering classic American cuisine with a modern flair. Grillfire offers appetizers-steaks-burgers-salads-sandwiches and desserts. Chilis Too: Casual favorites including burgers-baby back ribs- and chili among other items. Quiet suburban Arundel Mills-less than a mile away from Arundel Mills Mall and 10 miles south of Baltimore. Off of 295 providing quick access to National Business Park-Ft Meade and NSA.